Panic at the Federal Reserve 2007: Robert Rubin Calls at 5 P.M.
Based on the appointment calendars of Former Fed Chairman Ben Bernanke obtained under a Freedom of Information Act request filed by Wall Street On Parade, and the newly released Fed transcripts and documents from the financial crisis era, we are able to reconstruct the August 2007 panic that gripped the Fed Chairman, notwithstanding the dozens of headlines now proclaiming the Fed remained in the dark about the seriousness of the crisis. It started with a call to Bernanke from Citigroup’s Robert Rubin at 5 p.m. on August 8, 2007. By the next morning, it appeared that the Fed Chairman had gone into a high state of alert. At 11:00 a.m. the next morning (August 9, 2007) Bernanke met with Lewis Ranieri, the granddaddy of mortgage backed securities and a pioneer in the securitization market. Fed Governor Randall Kroszner and Sandy Braunstein, the Fed’s Director of the Division of Consumer and Community Affairs also attended this meeting. Immediately after a lunch break, Bernanke hauled in a wide swath of the hedge fund world. It is noteworthy that the Fed Chair chose to meet alone with these men with no other Fed Governors or Fed staff present. This raises the question, was Bernanke attempting to restrict information at the Fed as to just how dangerous the crisis had become? The hedge fund meeting included Ray Dalio of Bridgewater Associates whose newsletter had just the month before warned of the crazy leverage in the system. Aleksander Weiler, formerly of Tremont Capital and then at Weyerhaeuser Asset Management was also in attendance as were hedge fund money managers Stephen McMenamin and David Storrs. It’s not every day that the head of the U.S. central bank sits down alone with a group of hedge fund managers. At this point, Tim Geithner was President of the New York Fed where Bill Dudley, now President of the New York Fed, was running the open market operations and in daily touch with the biggest money center banks. 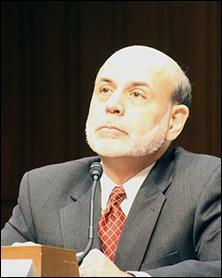 Why did Bernanke not rely on the intelligence they were providing? Why did he want to hear first hand from the people in the trenches? Rubin’s 5 p.m. call to Bernanke on August 8 came just three business days after CNBC’s Jim Cramer had gone ballistic over the out of touch, “know nothing” Fed. It is noteworthy that Cramer mentions Citigroup in the above exchange. What he is saying is that he put in a trade ticket to buy 500,000 shares of Citibank (Citigroup didn’t exist in 1990) at a price of $5 a share and the order was filled at that low price. By Thursday, March 5, 2009, Cramer would have been able to put in a bid at a buck for 500,000 shares of Citi and gotten filled. The stock traded as low as 97 cents that day and closed at $1.02. Between Rubin’s call and Cramer’s scream, it does seem that Bernanke decided to get personally involved in intelligence gathering. From the day of the meeting with the hedge funds and Ranieri, August 9, 2007, Bernanke conducted one to 3 anonymous conference calls every day to the end of the month, a total of 34 conference calls. That quantity of conference calls where the participants are anonymous in Fed records was unprecedented for Bernanke until August of 2007. As the above statement clarifies, this is the launch of the Fed as the buyer of last resort for the toxic sludge held on and off the Wall Street banks’ balance sheets and threatening their solvency.